Two football players were working out at a local fitness center where they were both members. They were both experienced weightlifters and had performed the lifts using the same weights numerous times before. One was using 50 pound dumbbells while the other was stretching on the ground. After he was done with his set he dropped them to the ground. Unbeknownst to him, his friend’s hand happened to be right below the dumbbells and one of them landed on his left hand severing his left ring finger instantly. The football player who lost his finger was rushed to the emergency room, but doctors where unable to reattach his severed finger due to the amount of trauma to the area. The young man brought suit against the fitness center for negligence and failure to supervise properly. He is seeking over $200,000 in damages. Injuries from weight lifting have been on the rise steadily due to increased popularity in physical fitness, especially strength training. One of the largest sources of exercise-related injuries is from weight-training. The major causes of injuries from free weights come from strains or lifting too much, improper lifting techniques, incorrectly secured weights, and dropping, hitting, or pinching oneself or another individual with the weights. From 1990 to 2007 there were over 970,000 weight training related injuries treated in emergency rooms in the United States. 82% of these injuries were sustained by males. Youths from the ages of 13 to 24 experienced 47% of the injuries. 90% of all weight lifting injuries came from the use of free weights. Understanding how to properly use and store weights is critical in ensuring all employees and gym members are as safe as possible in your facility’s weight room. 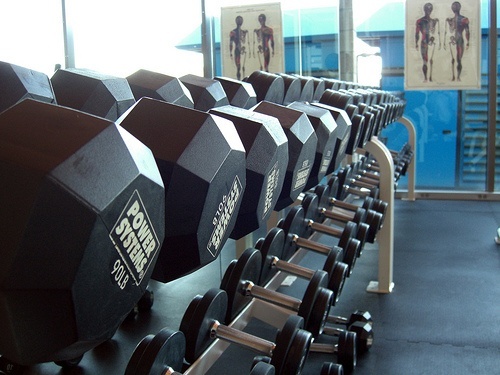 Every fitness center should have a clear written policy displayed detailing the proper use of weights, and staff should be instructed to make sure members are familiar with the policy. Make sure that weight plates, bars, and dumbbells are placed securely on racks. Also, encourage employees to regularly examine racks to make sure they are in good condition and not wearing down anywhere. Examine weight locks. If weight locks have become worn through frequent use they may slide off and cause weights to fall. Require all gym members to use weight locks when lifting. Require weights to be re-racked after use and encourage employees to frequently check for and pick up weights left on the floor. 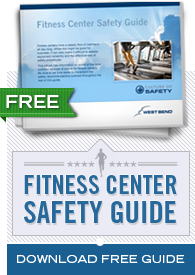 Weights left on the floor are a common problem for fitness centers and pose serious trip and fall hazards. Return all equipment including mats, dumbbells, bars, plates, weight belts, collars, and anything else used in the weight room to its designated place. Make sure benches and lifting apparatuses are adequately spaced apart to ensure that lifters do not interfere with one another. Make sure all weight stack machines have proper pins in place and that all pins are in good condition. Understand and encourage correct spotting techniques. If employees see patrons lifting weight without spotters, encourage them to offer assistance, and recommend lifters to always use spotters in the future. Require all staff and patrons to wear appropriate footwear. Appropriate footwear should be used everywhere in a fitness center, but it is especially important in weight lifting areas. Educate members about how to use weight lifting machines and the proper way to use free weights. One of the most significant reasons why individuals injure themselves weightlifting is because of improper lifting techniques. Staff should observe various individuals as they work out to see if they are doing anything improperly and then instruct them on correct form and technique.